From modern stations and super structures to historic train stations with age old architecture, Australia has a number of famous train stations in some of the most amazing places. Perhaps the most iconic station is Melbourne’s Flinders Street Station located on the corner of Swanston and Flinders Streets. It’s the busiest suburban railway station in the southern hemisphere and has been serviced by trains since as far back as 1854, however the iconic station as we know it now wasn’t built until 1910. The main platform measures 700m and is the longest in Australia. Part of the daily routine for almost 250,000 commuters, the station’s historic architecture and iconic clocks have cemented its place as one of Australia’s most famous railway stations. 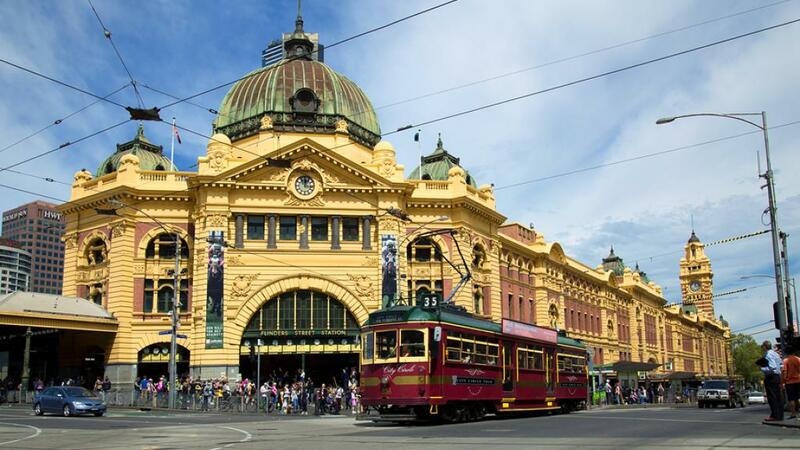 Also located in Melbourne, Southern Cross Railway Station is another famous Australian train station. Originally known as Spencer Street Station, this modern transport hub is situated on Spencer Street between Collins and La Trobe Streets, just 500m from Etihad Stadium. Averaging around 43,000 passengers each day, the state-of-the-art terminus services both the state regional rail network and suburban services including the overland rail service. The supersized station features an underground rail and coach terminus and more than 40 retailers including souvenirs, supermarkets, dining, banks, fashion, beauty and even car hire. In Sydney, Central Railway Station is one of the most iconic landmarks in the city and is also the central hub of the rail network. Characterised by its high arched roof and Grand Concourse, the station is a key interchange for trains, buses and trams. It too features a famous clock at its main entrance and has served the passengers of New South Wales for more than 100 years. In fact, during WWII the station moved thousands of troops and more recently, served a huge influx of passengers during the 2000 Sydney Olympic Games. One of the oldest remaining examples of historic stations, Kuranda Railway Station is home to the region’s famous scenic railway. Built in 1913, the station is one of the first in Australia to be built from standard concrete units. For over 100 years Kuranda has attracted visitors searching for its stunning scenic landscapes. As steamship passenger services to Cairns from Brisbane, Sydney and Melbourne began to increase, so too did tourism to the region. The rail line also grew and in 1924 a rail line to Brisbane was finally opened. Since then, Kuranda has remained one of the most photographed railway stations in world. Its stunning tropical gardens and heritage listed buildings make it a unique and especially beautiful station.